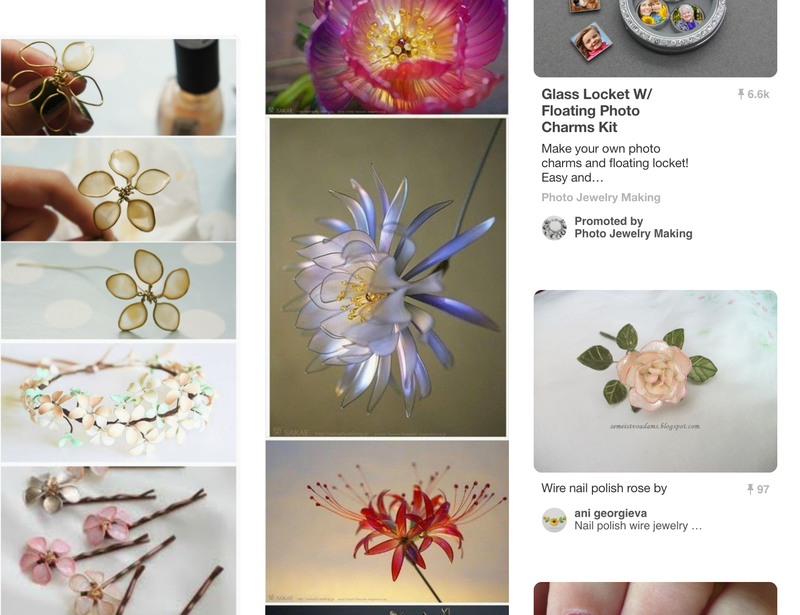 Faith, Hope and Art: Nail Polish Flowers.. Not a simple Pinterest Project! Nail Polish Flowers.. Not a simple Pinterest Project! I don't spend much time on Pinterest. I am too busy. However, while looking for something else, I saw "nail polish flowers" and really liked them. I have quite a few art 2 students that are not gifted drawing or painting students, so I am looking for ways to reach them using non-traditional means. I'm also looking for cheap and simple projects that can have a big wow factor. Nail polish flowers seemed like they might be a cool project that wasn't too hard and looked great. Knowing that the way things look on pinterest and real life are often not even close, I looked up a couple of tutorials and found that tacky glue was a necessary, yet left out instruction on most of the pinterest pins. I didn't have any tacky glue. So I tried Elmers. Don't. It doesn't work. So I bought some tacky glue. I already had wire and nail polish. I made a simple wire flower with petals that were about an inch long. This is not a big flower. This was not easy. The center worked because it was rather small so the glue didn't have much space to span. But filling the petals was hard! It wasn't impossible, but it took me almost 2 hours to get five petals filled with glue. Crazy. After I finally got all of the petals filled, as they dried, the largest petal broke. I refilled it and left it a little thicker this time! After giving the petals an hour or so to get mostly dry, I decided to go ahead and paint the petals before something happened to my flower! I was surprised at how simple this step was. And there you have it. One simple nail polish flower made from a little wire, some tacky glue and nail polish. And is this a project for my students? Well... I haven't decided. Getting the glue to stick to the wire in one think film was hard. I don't know that I am ready to hear my name and help together that many times in one class period! But man I can see in my mind the incredible projects that could be made with this process!! Nevertheless, I learned something new today and ultimately, that is my goal. One new thing everyday! I'd say "who would have thought" my new thing would be making a nail polish flower, but really for me, it fits! Now I have to go finish my bouquet! I fixed our broken recliners!